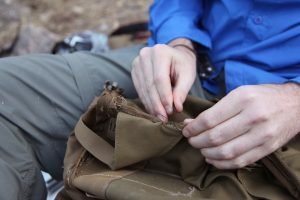 Big Bend Pack Repair: Thanks Mother Nature! Sometimes you have to think outside the box to get to where you are going. Back when we did the Outer Mountain Loop trail at Big Bend National Park our gear designer Ryan had to do just that. 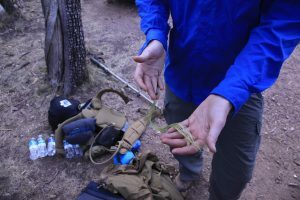 He was testing his new prototype pack when one of the shoulder straps started to come undone. No need to panic; he found a agave plant and made a needle and thread out of it! 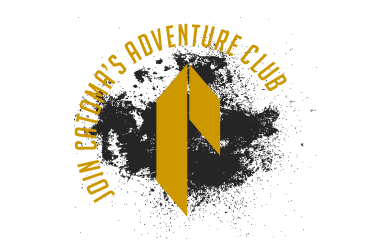 If you are ever in the same predicament just tear off a piece long enough and beat it against a rock to break it up enough so you can sew with it. He actually made it the rest of the trip without having to redo it.